Origins of the phrase: "Those who are about to die salute you." This staple of swords-and-sandals fiction, the gladiator’s salute to his Emperor, in fact likely never happened. 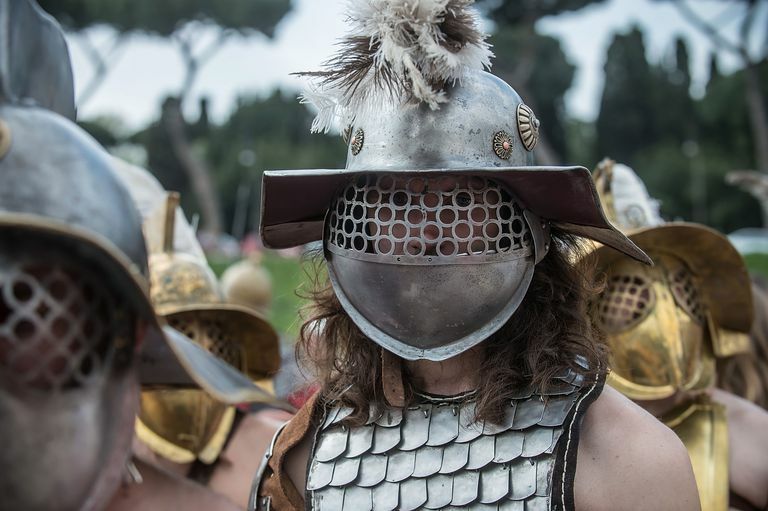 Only a handful of Roman historians, long after the fact, mention the phrase — literally, “Hail, Emperor, those who are about to die salute you” — and there’s little indication that it was in common usage in gladiatorial combat or any other games in ancient Rome. Nonetheless, “Morituri te salutant” has gained considerable currency in both popular culture and academia. Russell Crowe mouths it in the film “Gladiator,” and it’s used over and over by heavy metal bands (most cheekily by AC/DC, who tweaked it “For those about to about to rock, we salute you.”). Where did the phrase “Morituri te salutant” and its variations (…morituri te salutamus, or “we salute you”) come from? According to the historian Suetonius’s Life of the Divine Claudius, the account of that emperor’s reign in his compendium The 12 Caesars, written around 112 A.D., it stems from a peculiar event. After this, the historians disagree. Suetonius says that the men, believing themselves pardoned by Claudius, refused to fight. The emperor ultimately cajoled and threatened them into sailing against one another. Cassius Dio, who wrote about the event in the 3rd century B.C., said the men merely pretended to fight until Claudius lost patience and commanded them to die. Tacitus mentions the event, some 50 years after it happened, but doesn’t mention the plea by the gladiators (or more precisely, naumachiarii). He relates, though, that a large number of prisoners were spared, having fought with the valor of free men. In addition to the above-mentioned films and rock albums, Te morituri… is also invoked in Conrad’s Heart of Darkness and James Joyce’s Ulysses. What Did Gladiators Get When They Were Freed? How Do You Say 'Happy Birthday' in Latin?